An Indian journalist in the post-game press conference began his question to World Champion Vishy Anand, “you played e4 to thunderous applause from the young chess fans in Chennai…”, but in terms of excitement it was downhill from there in Game 2 of the World Championship match. 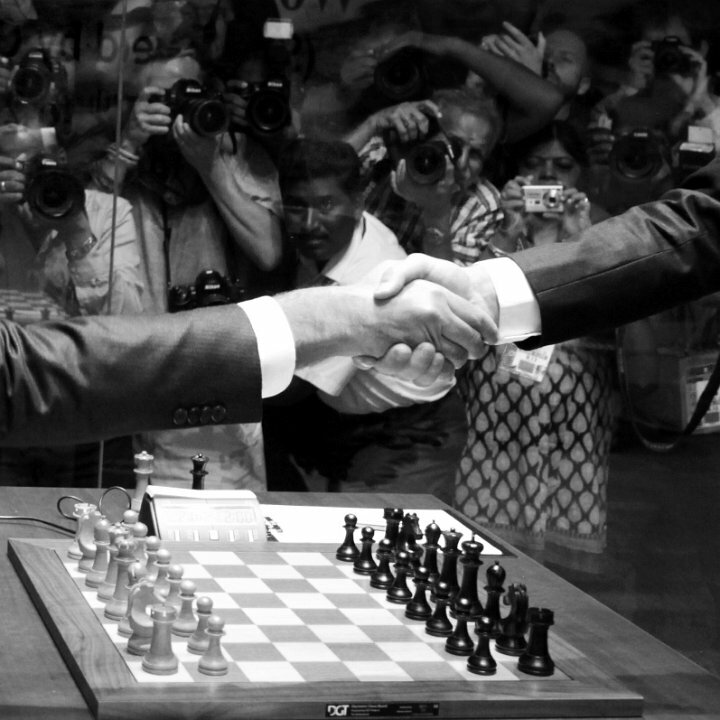 Magnus Carlsen surprised his opponent with his reply, Anand chose a cautious line of play and after only 25 moves the players had again drawn by repeating moves. As chess24’s GM Rustam Kasimdzhanov points out in his analysis, however, Carlsen’s choice would actually have been “a risky opening experiment” - if Anand had been ready for a sharp fight. Although the chess in Chennai is yet to burst into life the anticipation around the match has long since reached fever pitch. Whether Magnus can match Vishy’s numbers with a billion Indians behind him is doubtful, but he’s gathered attention not usually devoted to chess players! The one place the studious atmosphere hasn’t taken hold is among the scrum of photographers fighting to capture the players’ expressions at the start of each game. 2. d4 d5 3. ♘c3 Vishy always seemed to prefer this natural move to the committal 3. e5. 8. ♘e5 ♗h7 9. ♗d3 ♗xd3 10. ♕xd3 ♘d7 11. f4 ♗b4+ 12. c3 ♗e7 13. ♗d2 ♘gf6 14. 0-0-0⁉ And in fact Vishy is the first to deviate! 14. ♕e2 brought him success recently, and one wonders what Magnus prepared here. 14... 0-0⁉ might be ok for Black. (14... c5 15. dxc5 ♕c7 16. b4 0-0 17. 0-0 a5 18. a3 1-0 (32) Anand, V (2783)-Ding,L (2707) Paris/St Petersburg 2013) 15. f5 ♗d6 16. fxe6 fxe6 17. 0-0-0 ♕c7 18. ♖he1 c5 looks messy. 14... 0-0 15. ♘e4⁈ Clearly not the most aggressive approach... It seems Vishy isn't willing to take many risks at the beginning of the match. Kb1 or Qf3!? look far more critical. c) 15... c5 Probably the best move. c1) 16. dxc5 ♗xc5 17. ♖he1 ♖c8 (17... ♕c7⁉ 18. ♘xd7 ♕xd7 19. f5 ♕a4 ) 18. ♔b1 ♕c7 19. ♘xd7 ♕xd7 20. f5 ♕c6 21. fxe6 ♕xf3 22. exf7+ ♖xf7 23. gxf3 ♗f2! c2) 16. ♕xb7? only brings sorrow. 16... ♖b8 17. ♕xa7 (17. ♕a6 cxd4 18. ♘c6 ♖b6 ) 17... ♕c8! c3) 16. ♗e3! White exerts some pressure and Black has to tread very carefully. c32) 16... ♕c7 17. ♘xd7 ♘xd7 18. d5 (18. ♘e4⁉ ) 18... ♘f6 19. dxe6 fxe6 20. ♔b1 ♖ad8 21. ♗c1 feels better for White, plain and simple. 15... ♘xe4 16. ♕xe4 ♘xe5 Simple chess. Alternatives were risky for Black. 18. ♕g4 f5 19. ♕g6 ♕xa2 20. ♗xh6 ♖f7 I really don't see why White should be better at all; in fact Black's play with b5-b4 could get dangerous. The press conference was mildly perplexing as Anand and Carlsen appeared to think a possible continuation to the game (18.Qg4 f5 19.Qg6) - suggested by both Rustam above and powerful computers - was bad for Black, but perhaps the most "memorable" moment was when the players were asked if they were going to watch the Arsenal - Manchester United football game that evening. Anand was but wasn't sure if he'd switch off his computers during it, while Carlsen replied in the off-hand manner we've become accustomed to from the young star. Yeah, sure, now that you mention it. Let's hope that after tomorrow's first rest day the players return in the mood for a real fight!